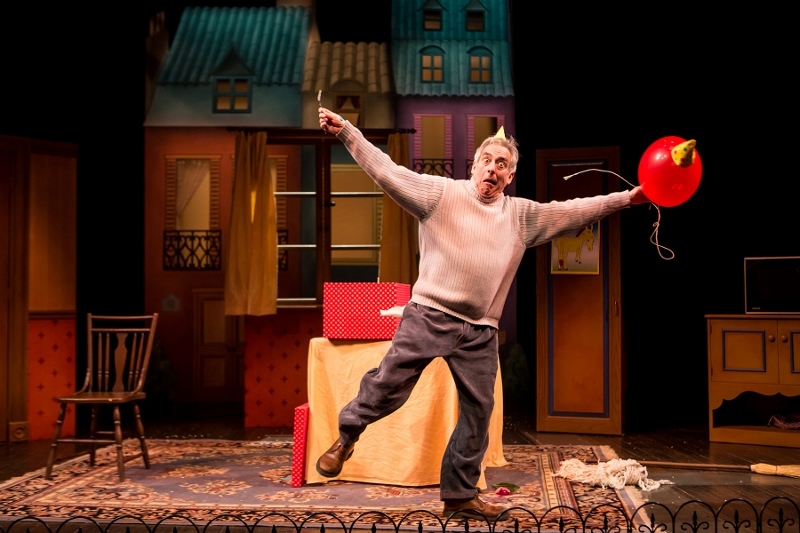 By TAMAR NEUMANN: Balloonacy, the Children’s Theatre Company’s (CTC) new play for preschoolers, is a delightful little play about a man and a red balloon. While the play is not long (a running time of only 30 minutes—it is designed for children with short attention spans), it manages to capture a range of emotions. This is partly due to the script by Barry Kornhauser, but it is mainly due to Robert Dorfman’s performance. Dorfman knows his audience well and plays each moment with the perfect range of emotion. Some moments are over-exaggerated in an effort to reel the children in and make them laugh, while other moments are soft and subtle. It is fun to watch Dorfman being thwarted by the balloon, then becoming friends with the balloon, then fighting with the balloon, and then, finally, living happily ever after with the balloon. Because of Dorfman, the balloon itself becomes a character full of silliness and tenderness. As is true with most CTC productions, the kids in the audience sometimes become a key part of the play, especially when the play is designed for preschoolers. The CTC’s Early Childhood Initiative allows for children who are just barely old enough to walk and talk the chance to see live theatre. And there is nothing better than attending a play where the audience is as involved as the actor. During this performance a young child in front of me got so excited when the balloon thwarted Dorfman once again that the child shouted out “It tricked you!” Wouldn’t it be wonderful if every time you saw a play you could shout out exactly what you were thinking? Maybe we should consider bringing that type of audience interaction back to theatre. While this play was not groundbreaking, and it is not going to change any kind of political thinking or actions, it provided me an opportunity to see theatre through the eyes of a child seeing a show for the first time—my son. Watching him watch the stage with wonder, concern, and laughter reminded me of the magic of simple theatre. As we applauded he asked to see more. I couldn’t help but smile at his enthusiasm. That’s what this simple show can inspire: a lifelong love of theatre. Balloonacy, by Barry Kornhauser. March 25 – May 4, 2014 at the Children’s Theatre Company, 2400 3rd Ave. S., Minneapolis. Tickets: $10 and up; purchase tickets at www.childrenstheatre.org or 612.874.0400.